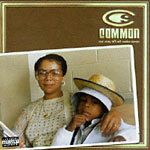 Common's third full-length album, released after a ridiculous lawsuit in which he had to drop the 'Sense' from his name. The Chicago based hip hop legend received high marks and critical acclaim with this album, setting aside unwanted attention after some brief beef with Ice Cube and trading it in to focus on a very personal memoir reflecting on his childhood, his relationship with his father, the birth of his first child and becoming a father himself. Featuring production by longtime collaborater No I.D. and apearances by Q-Tip, Lauryn Hill, Black Thought, De La Soul and more. This classic album, now a decade old, is one of the best commercially successful hip hop releases to emerge from the late 90's era of the music. A time we all know to be the start of the down hill slope hip hop would take, as major record labels in the industry started to drop their rap acts left and right if they weren't able to market the music and make the sales. Today...this album makes perfect sense.